Every holiday since 2010, Sarah Pekkanen has released an eShort story. I've grown to expect them because I know they are good reads. This holiday season, Sarah Pekkanen released Beginning Again, a continuation of the eShort stories All is Bright and Love, Accidentally. It is told from the point of view of Corrine Brown, Ilsa's sister. She is separated from her husband and going alone to her sister's wedding. The long and lonely weekend has Corrine eager to return back to L.A. But there really isn't anything left there. Corrine has to start anew. 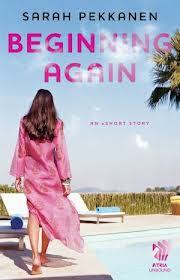 Beginning Again shows that life is not over after heartbreak. You can begin again and love. Download this heartwarming, well told story for just $.99 and get a bonus excerpt of Sarah Pekkanen's new book, The Best of Us. Then visit www.sarahpekkanen.com to vote for who should narrate the next installment of these linked eShort stories.